Let’s start with the positives. Juicing is a great way for our bodies to quickly absorb all the amazing nutrients found in fruit and vegetables. It’s also a way of fasting without totally depriving our bodies. Why fast? For me personally, it’s about giving my digestive system a well deserved break. Sometimes I struggle with an upset tummy which is heavy and bloated; fasting is a way of letting my body rest and recover. I also find that as soon as my stomach plays up, my skin tends to break out. I’ve always maintained that the skin and stomach are linked – so I hoped to see an improvement during and after fasting. Fasting may also be a good incentive to reassess your relationship with food. If you’re an emotional eater, have tendencies to over eat, or binge from time to time, this could be a great way to “reset” your habits. Break your fast slowly with well portioned, healthy meals. On the flip side, there are a few reasons people use to rationalise a juice fast which I don’t wholly agree with. Firstly, no amount of juicing is going to detox you of years of bad habits. In fact, our bodies are constantly dexoting naturally (think about your kidney, liver, colon and skin). Essentially, a juice fast isn’t a quick fix for anything. This also applies to weight loss – people shed quite a bit of water weight when fasting, and mistake this for a reduction in body fat. If you can use your fast to kick off a healthy eating regimen accompanied with exercise, great! But don’t be fooled in thinking that you can keep unhealthy habits and lose weight with the occasional fast. Day 1: Oh this is fine, I’m not as hungry as I expected. These juices taste incredible! I should do this more often. I’d like a little snack on something before I sleep but I’m going to persevere. Day 2: So this is harder than I expected. At least the juices are amazing, better not drink them too fast. Don’t think of food. Don’t pass the bakery. Oh god I don’t think I can sleep unless I eat. Day 3: Someone give me a baguette. I always assumed that the first day would be the hardest, and as I slowly acclimatise to eating less, I would be quite okay with out eatings solids by the third day. Boy was I wrong, it was the complete opposite! I am, however, so glad I persisted with the juicing. My stomach feels much better for having a break from continuously digesting, my skin has cleared up, I feel generally lighter and therefore have more energy. Having freshly made juices with organic ingredients made a huge difference to the taste, which helped immensely with my often weak will to abstain from eating. With Pure Jus you get 6 juices and 2 herbal teas per day, and when spaced throughout the day, I didn’t have much time in between drinks! My conclusion? Juices are great on their own or with meals, as long as you’re realistic about your goals and why you’re fasting. It’s not a one stop shop to wash away months of sin, but it’s something that can be done regularly to help your body rest, reset, and absorb loads of nutrients. I’ll definitely make it a regular habit! 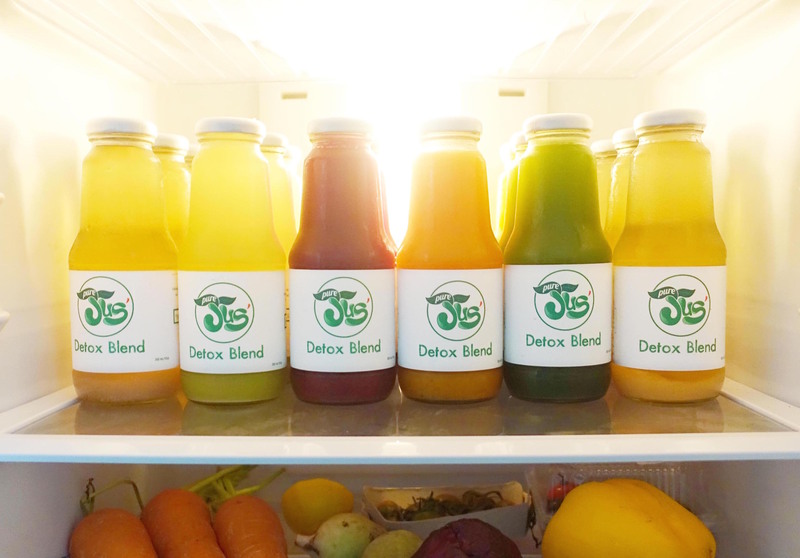 Hi Mari, Thank you for sharing your experience with the juice cleanse. I’ve always wanted to try it but wasn’t really sure what to expect. I live in New York and lead a stressful, fast paced life which has somehow resulted in not so great eating habits. Your posts have definitely inspired me to incorporate more fruits and veggies in my diet. Thank you so much! Hi Geraldine, I’m so glad you’ve been inspired to eat well! You will feel great when you fuel your body with the right ingredients. Good luck!